A loan of $5,000 helped purchase the equipment I need to make my soaps in larger quantity in a shorter amount of time so that I can move toward gaining a larger retail client base. My family and I have lived in the heart of the Silicon Valley for about thirteen years. We are not tech people. I have watched people's eyes glaze over at parties as I try to tell them my elevator pitch. It doesn’t include a position with Google or Facebook and, until now, has not had a particularly interesting punchline. In 2010 that all changed. On the last day of classes for my college composition teaching certificate, my colleagues asked me, "What are you going to do now that you're finished?" I paused and thought for a second then said, "I think I'm going to get a goat." They all laughed, knowing I had a dry sense of humor, then prompted me to give a serious answer. I searched my head and my heart then repeated, "No, really, I'm going to get a goat." I had no idea what I was going to do with a goat (I've never owned anything more serious than a few chickens), or how far reaching the changes would be for me and my family when I did. It just felt, in that moment, that getting a goat was what I needed to do. Four years later I now have six goats, with three pregnant and due to kid in early March. My goats have led me and my family on an adventure of responsibility and wonder, new avenues and new friends. Getting a goat was definitely not the logical step for me. But while I adore logic, it is not the fuel that drives me. I more like to feel my way through life and enjoy the many surprises that this approach to living can bring. In 2010 I bought my first goat as an adverse reaction to too many years of graduate school. I wanted to get out of my intellect and bring more "real" life into my house and my heart, and to reconnect with the creative energy that used to be so much a part of who I was. A friend, at the time, started an underground market and prompted me to sell the goat cheeses that I was learning how to make. In October 2010, Faerie Goatmother was born. I taught myself how to make cold process soap and began introducing soap alongside my cheeses and, little by little, people came to seek out the soaps. They loved how gentle and moisturizing they were, but they also loved that the milk used to make the bars came from goats that live in my backyard -- a source that they could understand and recognize. Over the past four years, Faerie Goatmother has developed a devout following of soap lovers. In November 2013, I finally realized a way to marry my past as a writer and editor with my present as an artisan soap maker. I attended a field trip with my son at an art exhibit called "Bibliophilia", where all of the pieces were made from books or book parts. Inspired by the exhibit, I came to the epiphany that much like a fairy godmother grants wishes, Faerie Goatmother can donate a portion of proceeds to worthy organizations that encourage a love of reading and writing. I began redesigning the labels for the soaps - creating the packaging from old books and discarded literary magazines. So now, each bar is wrapped in a page of a story or a poem, and each bar is as unique as the words that enshroud it. Faerie Goatmother has also gone organic so now I can feel comfortable knowing that all of my soap making oils come from single source, sustainable farms and fall in line with my "help, don't harm" company values. Faerie Goatmother seeks to spread the love. I am finding more retail outlets for our products and need new equipment to step up production. I am also working toward hiring my first employee, with the ultimate goal of building Faerie Goatmother into a farm that can serve as both soap making headquarters and a summer camp for kids to teach them about environmental activism and sustainable living practices. The purchase of essential oils in bulk will drive my per-bar cost down so that I can absorb the increased expense of organic ingredients without passing that cost to the customer. A big part of Faerie Goatmother is creating a brand that people feel a personal connection with -- whether it's a community connection with me as the personality behind the product, or with a sense of helping themselves and the environment by using an organic product, or with knowing that a portion of the money they spend on this affordable luxury will be going to some very worthy causes. This loan will help take Faerie Goatmother to the next level by increasing both production and profit which will, in time, translate to bigger contributions in our community and beyond. Why are you endorsing Julianne? Julianne is passionate about Faerie Goatmother. 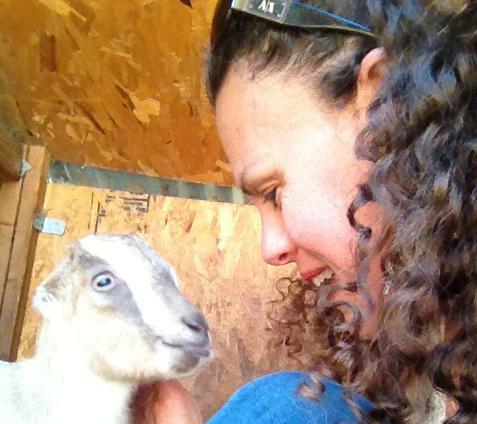 Her goats are not only farm animals, but pets and companions. The quality of milk is linked inextricably to their health, and from birthing to feeding to housing, Julianne has made the goats’ well-being a number one priority. Julianne is a fantastic partner. She had thoroughly calculated all the costs and profits of her business, and had all the necessary documents ready as soon as they were asked for. Furthermore, she has long term plans for Faerie Goatmother that elicit enthusiasm from not only herself, but all who get to share in her vision.